Being that I recently took the plunge to a static site hosted on AWS S3 I thought I would create a post outlining the high-level process for future reference. There are quite a few blogs in the interwebs outining this process, but if this helps someone else too then it’s a win-win. If you are curious as to WHY I migrated, you can find a short bit about that in this post. I purposefully made this a longer post outlining the entire process versus breaking it into smaller ones so that everything is in the same place and easy to find and understand. Use the ToC to help navigate. If you happen to be reading this and actually have a question, please contact me and I’ll be as forthcoming as I can. Let’s jump in. While most builders don’t cover all of those items, some do get close enough. Ultimately, I decided on Hugo with Jekyll still being a close second. Once I knew what platform and builder I was going to use I could start exporting my data from WordPress and import it into Hugo. Fortunately, Hugo has some great instructions here. The 2 native plugins didn’t work for me that well, so I went with their other suggested method of exporting to Jekyll then converting the data to Hugo format. Either way is relatively simple if you follow their steps. I imagine this will change over time, so I’m not going to offer more detail. I then followed their instructions to install and start using Hugo. I went through the install and setup on my PC without issue. Importing the data is just a matter of dragging and dropping the files into Hugo’s folder structure. With Hugo installed and my data imported I wanted a better editor. One of the bigger complaints I had with Wordpress was using their built-in editor. I had to login to my website to use the editor, and much of the time the formatting did not align with my theme and what visitors saw. This made it challenging to create a standard feel across the site. The new editor needed to provide some Syntax help and highlighting, be usable offline, and compatible with GIT. Two of the most prominent editors in this space are Microsoft’s VS Code and Axon. I have used Axon before, so I thought I’d try VS Code this time. So far I am pleased, but either one should at least fulfill most of your requirements. Another capability I really wanted was to be able to edit my blog easily from anywhere. To do this I’m using CodeHub and MWeb on the iPad along with FastHub on Android. Both of these sync with GitHub (I’ll talk more about that below) and allow me to easily edit while I’m on the go. I find this to be very convenient. In fact, I’m editing this very post on the iPad while sitting on the couch, and on my phone at lunch, and at my PC for screen shots. The only drawback is I can’t preview my edits as well, but that’s why a dev site/bucket is useful! Using VS Code I saw that I could view and edit my files and even build my site using Hugo right from its GUI. Of course, the site won’t build properly without a theme. One of the great things about Hugo is the many themes available to help get started quickly. I browsed [https://themes.gohugo.io] and eventually settled on the Tranquilpeak theme. Each theme comes with its own documentation and customizations, so it took a little time to find one I really wanted. Another positive for hugo is the ability to preview themes, changes, and addons quickly. All you have to do is run the hugo server command. You can leave this running and it will update automatically anytime a file is modified and saved. You can preview your site on the device running Hugo by opening a web browser and entering http://127.0.0.1:1313/. Once satisfied I built the site and prepared it for upload. Building the site is easier than previewing it! Just run hugo which will build the site using all of the custom configuration and content and then save it to the public/ folder. The contents of this folder can then be copied to your webserver (or in this case an AWS S3 bucket). One of my other big reasons for moving to a static site was version control. With WordPress everything is live. Sure, you can have drafts, but once you publish it there is no going back. If you want backups of previous versions then you have to do that yourself, or maybe find a plugin if one even exists. Being that I’m not a developer I entered the GitHub scene late. Now that I’ve discovered its potential though I’m not sure how I ever lived without it! It is completely based around version control and Continuous Deployment. This means my edits are safe and reversable, I have built-in backups, I can edit new posts in seperate dedicated branches, and I can seamlessly integrate with S3! 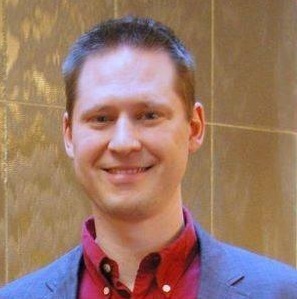 So, I created a new repo for this site and began uploading my data. 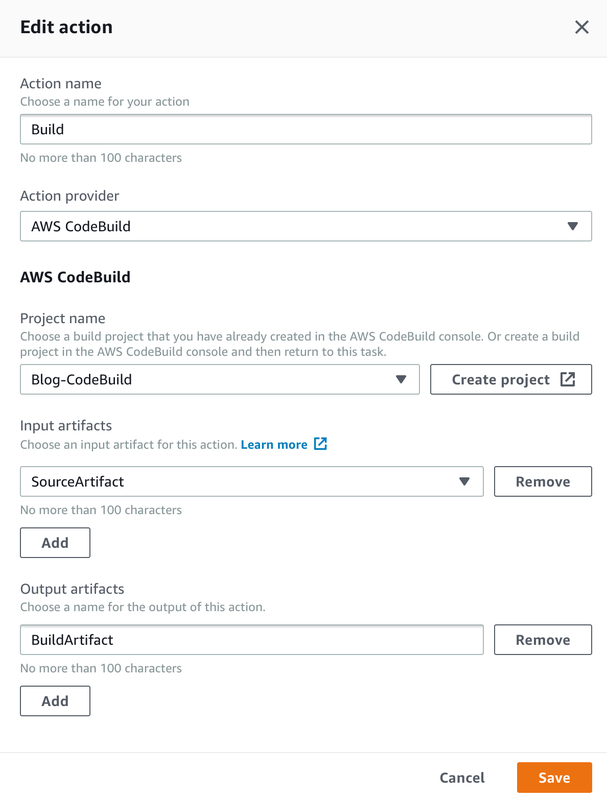 Now, you might be thinking why not use AWS CodeBuild? Well, the truth is I was already comfortable with GitHub and knew I could setup this site quickly there. 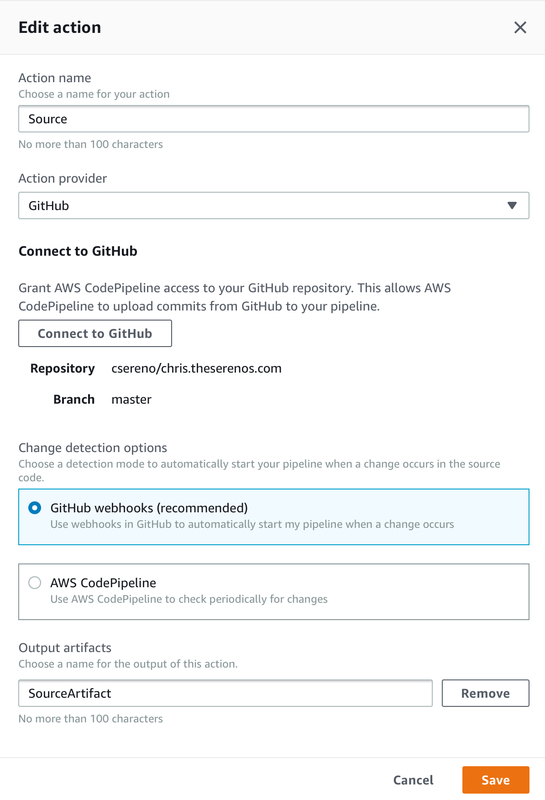 I am using AWS CodePipeline to integrate with GitHub and deploy to S3. I have plans to look into CodeBuild further and decide if moving the site’s code to there makes more sense. Back in VS Code I configured it to sync with GitHub. This was rather trivial and I was able to commit my code in no time. Git does need a little configuration of its own though, so here is the contents of my .gitignore file instructing Git on what to ignore when uploading and building code. With my files on GitHub I could rest easy that I had versions and a backup, but this isn’t where I was actually going to publish my site. I needed a way to automatically build the site when a commit was made and push the results to my S3 bucket. This is where CodePipeline becomes useful. Once the GitHub integration was complete and I could see CodePipeline receiving the updates and passing builds I moved on to locking down my S3 bucket. I use CloudFlare for my CDN and wanted an SSL connection to my S3 bucket. This meant I needed to use CloudFront to expose my site to the world. If I find that prices are cheap enough I might move to just using CloudFront, but for now this is what I’m using. So, my S3 bucket only allows connections from CloudFront and CodePipeline. Everything else is denied. I’ve stripped out the more sensitive bits. "AWS": "arn:aws:iam::cloudfront:user/CloudFront Origin Access Identity ******"
For CloudFront I just needed it to serve the content via HTTPS, provide IPv6, and reroute HTTP to HTTPS. So, I enable those options and elected to use the default SSL cert. I don’t do any caching. The only thing CloudFront does do is refer to a Lambda job that converts standard URL requests and appends a “/“ to make the request Hugo compatible. This is the code in the Lambda job to convert the URI requests to include a “/“ and make them more suitable to Hugo and a static site. Last, but not least, I setup CloudFlare to point to the given CloudFront URL and enable caching. This is also where I take advantage of CloudFlare’s additional security offerings. I have strict SSL enabled, HSTS options, higher TLS versions, further challenges for nefarious countries and IPs, and more. Not only that, but CloudFlare also helps enhance images and improves loading time. CloudFlare is relatively simple to setup if you have done any DNS configuration in the past. Even if not, they help you quite a bit. Some images didn’t convert right and WordPress created a lot of duplicates I had to delete. I’m still not 100% satisfied with my Hugo file structure. I might have to revisit this. Still learning some tricks for editing from mobile devices. Everything is public on GitHub with free repos, so I can’t have a personal or private area if I wanted one.